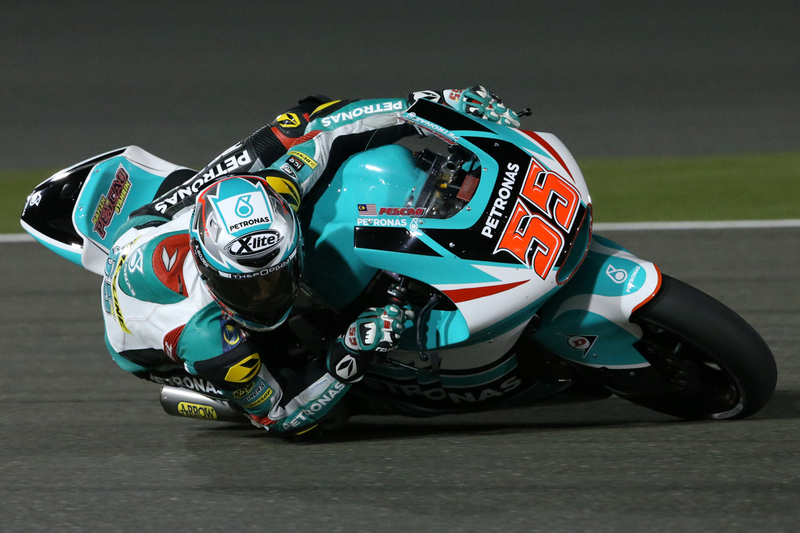 Hafizh Syahrin enjoyed a competitive start to the 2016 season onboard his Kalex as he overcame a challenging 20-lap Moto2 race and a numb hand to finish fourth, hauling 13 precious points at the Qatar Grand Prix on Sunday. The PETRONAS Raceline Malaysia rider qualified 16th but was promoted to 15th on the starting grid after Lorenzo Baldassarri forfeited the race having sustained injuries in a heavy crash during qualifying. Even so, it did very little to help Hafizh as a botched start denied him the opportunity to close the gap on the front. Hafizh instead had to push the limits to muscle his way through the field and his hard work paid off when he caught up with the leading pack by the fifth lap after Johann Zarco, Sam Lowes, Marcel Schrotter, Alex Rins, Robin Mulhauser and Takaaki Nakagami were given ride-through penalties having jumpstarted the race. The PETRONAS Talent Development rider eventually crossed fifth at the finish line, but with second-placed Franco Morbidelli given a penalty and relegating the Italian down to seventh, Hafizh was promoted up to fourth in 40’27.851s.